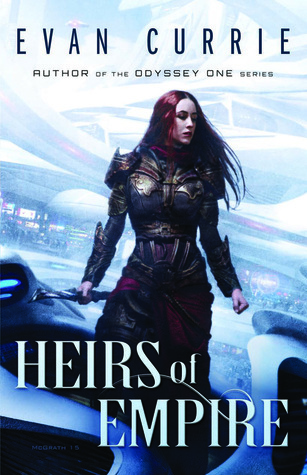 Heirs of Empire is a novel which blends sci-fi and fantasy, by Evan Currie; he’s gained a lot of traction recently with his Odyssey One series of sci-fi novels, and it’s great to see him turning his hand to something slightly different here. The world that Currie posits in Heirs is an interesting one. It begins feeling like a melange of a fantasy world and a high-tech paradise. There are knights, an Emperor, and other trappings of a medieval social structure, over the top of bullet trains, laser carbines and personal flying craft. The mixture actually works very well – I was particularly impressed with eh Armati – seemingly psychically linked melee weapons, which seemed to shift shapes to take on different tactical roles, with a degree of semi-sentience. There’s some great backstory as well. Various points of dialogue allude to unseen threats in the margins of the world as shown to the reader. There’s also hints at a deeper history – the Armati are weapons that can no longer be crafted, for example – and stories of how the ancestors of the current characters reached their location are vague, but suggest they fled a long term conflict. The nature of the world is also not exactly what it appears to be. There’s discussion of a radiation belt girdling the atmosphere, and there’s several different ‘layers’ of sky, of various levels of permeability to skilled flyers. Suffice to say that the world is not…entirely what it appears to be. Moving from a macro scale to the more personal, Currie’s managed to give us a complex set of socio-political systems, which wrap his characters in conflict. There’s the Imperial family. There’s the senate. There’s armies of heavily armed troops. There’s the Cadre, an elite force whose training and bonding with the Armati weapons gives them a hefty edge in combat. It all swirls around the central pivots of the plot and characters, and defines them in a vibrant, living world. Speaking of characters; when I reviewed Currie’s “Odyssey One”, I expressed some dissatisfaction at the way the characters existed to serve the plot. I’m happy to say that there’s certainly a lot less of that here. I wouldn’t say that we get to mine the depths of any individual psyche, but each character feels rounded enough to be believable. The larger slices of the book are given over to Mira Delsol, a member of the elite Cadre, and two younger members of the Imperial family. Delsol’s arc is one which I wish had a little more page space. She begins as a loyal member of the Imperial forces, before incidents at the start of the book move her onto a different path. She suffers from anger issues, and has a layer of cynicism over a core of emotional betrayal which is rather well done in the time available. It would have been great to see her given extra time to display some more emotional depth, but Delsol sizzles off of every page that she’s on anyway. The Imperial twins stand in Delsol’s shade a little. There’s much made of what pains in the backside they can be, but we don’t get to see much of this. Actually, they start out as fairly civilised, if somewhat entitled. The corners get knocked off of them a bit over the course of the text, and their relationship with another pair of younger characters is simultaneously amusing and heartwarming. Again, they spend a lot of time Doing Things, and we don’t see a great deal of introspection. That said, they’re not a particularly aggravating read, and carry enough personality to keep them distinct and interesting. Plot-wise – well, as ever, I’ll avoid saying much for fear of spoilers. However, it’s safe to say that the book kicks off with a bang, and never really let’s up thereafter. Currie has always been good at writing visceral, fast-paced action, and that trend continues here. There’s a range between hand to hand combat and sprawling battles, as well as some rather speedy air combat. The plot itself is fairly straightforward, and it manages to explain the stakes quickly and efficiently, whilst also keeping up a roller coaster of action – betrayals, explosions, the occasional Moment of Awesome, it’s all there, and all compulsively written. Overall, this is an excellent start to a new series from Currie. The world is detailed, and clearly has more to reveal. The characters could use more room to manoeuvre, but they’re sufficiently well drawn to get you to care about them, their emotions, and their fates. The plot absolutely crackles, and there’s some excellent moments of contemplation matched against sections of sheer adrenaline. As an experience, the book was a lot of fun to read, and I’m looking forward to seeing where Currie takes us next.